EG Solutions – Whaley Construction, LLC. This letter is written as a reference for Whaley & Sons, Inc., a general contractor located in Kodak, Tennessee. Whaley and Sons built the West Development Area at the McGhee Tyson Airport operated by the Metropolitan Knoxville Airport Authority. This was a major project involving multiple FAA grants, extensive earthwork, value engineering and interfacing with three separate but adjacent projects by others. I was the Program Manager and consulting Engineer of Record for the project done by Whaley. 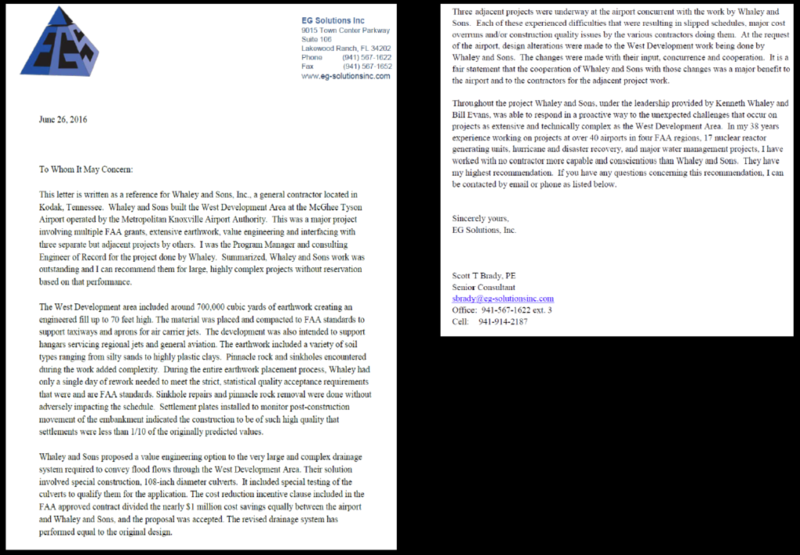 Summarized, Whaley and Sons’ work was outstanding and I can recommend them for large, highly complex projects without reservation based on that performance. The west Development area included around 70,000 cubic yards of earthwork creating an engineered fill up to 70 feet high. The material was placed and compacted to FAA standards to support taxiways and aprons for carrier jets. The development was also intended to support hangars servicing regional jets and general aviation. The earthwork included a variety of soil types ranging from silty sands to highly plastic clays. Pinnacle rock and sinkholes encountered during the work added complexity. During the entire earthwork placement process, Whaley had only a single day of rework needed to meet the strict, statistical quality acceptance requirements that were and are FAA standards. Sinkhole repairs and pinnacle rock removal were done without adversely impacting the schedule. Settlement plates installed to monitor the post-construction movement of the embankment indicated the construction to be of such high quality that settlements were less than 1/10 of the originally predicted values. Whaley and Sons proposed a value engineering option to the very large and complex drainage system required to convey flooed flows throught the West Development Area. Their solution involved special construction, 108-inch diameter culverts. It included special testing of the culverts to qualify them for the application. The cost reduction incentive clause included in the FAA approved contract divided the nearly $1 million cost savings equally between the airport and Whaley and Sons, and the proposal was accepted. The revised drainage system has performed equal to the original design. Three adjacent projects were underway at the airport concurrent with the work by Whaley and Sons. Each of these experienced difficulties that were resulting in slipped schedules, major cost overruns and/or construction quality issues by the various contractors doing them. At the request of the airport, design alterations were made to the West Development work being done by Whaley and Sons. The changes were made with their input, concurrence, and cooperation. It is a fair statement that the cooperation of Whaley and Sons with those changes was a major benefit to the airport and to the contractors for the adjacent project work. Throughout the project Whaley and Sons, under the leadership provided by Kenneth Whaley and Bill Evans, was able to respond in a proactive way to the unexpected challenges that occur on projects as extensive and technically complex as the West Develpment Area. In my 38 years experience working on projects at over 40 airports in four FAA regions, 17 nuclear reactor generating units, hurrican and disaster recovery, and major water management projects, I have worked with no contractor more capable and conscientiouis than Whaly and Sons. They have my highest recommendation. If you have questions concerning this recommendation, I can be contacted by email or phone as listed below.